Pakistan is on the verge of a new dawn as former cricketer turned politician, Imran Khan is set to assume the post of Prime Minister. It was the 65-year-old Khan’s Pakistan Tehreek-i-Insaf (PTI) party that has emerged as the single largest party in the Pakistan National Assembly on Thursday as the vote count rolled in. 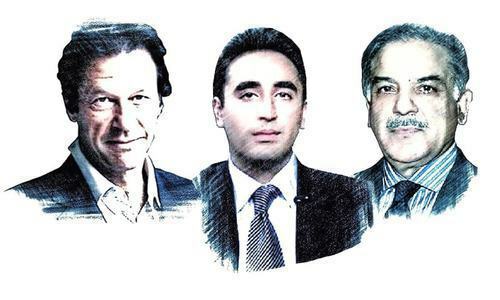 The frontrunners were reduced to three parties: Pakistan Muslim League-Nawaz (PML-N), Pakistan Peoples Party (PPP) and Pakistan Tehreek-i-Insaf (PTI). It is reported that 105 million citizens registered voters flocked to polling stations across the country to cast their vote with 800,000 strong security detail including 371,000 soldiers were deployed to maintain order during Pakistan’s 11th general election. Across the gender line there was 59 million males and 47 million females voters besides 1,913 transgender voters, of whom 1,356 are in Punjab alone. Khan is set to be the Prime Minister of the only Islamic nation that is armed with nuclear weapons with this being only the second time that civilian transfer of power has happened in Pakistan’s 71-year history. All other appointments of power of the Islamic nation have been marred by coups and military actions. The incoming Prime Minister Imran Khan is set have substantial resources at his disposal to form a government without ‘unwanted’ allies. Khan in August 2014 during ‘Azadi March’ in Islamabad demanded new polls after laying claims that the general election that brought Nawaz Sharif to power was rigged. The PTI leader has been critical of PM Nawaz Sharifs’ government and celebrated the moment when the Pakistan Supreme Court disqualified Prime Minister Nawaz Sharif in Islamabad on July 30, 2017. Khan’s PTI party once installed officially are assuming control of a nation where they are have no crippling levels of circular debt shut down large parts of the power supply chain, no 20-hour-long blackouts and no imminent depletion of the reserves like there was in 2013. There is pressure on the foreign exchange reserves, undoubtedly, and some extraordinary steps are being taken by the State Bank to stem outflows even if these steps impact the conduct of day-to-day business. But there is no manifest sign of crisis, no disruptive impact on day-to-day life, and reserves will not be hitting critical levels for another few months. The biggest economic concern for Khan will be the foreign exchange reserves that are depleting at the rate of $1.2 billion per month approximately, with barely enough to provide two months of import cover at the moment. Khan will have to nail down his parliamentary partners very quickly in the short time it has before economic matters reach critical proportions? Fiscal status: the fiscal situation, which will require a mini budget to manage. Next, the circular debt, which will require dealing with the power producers, who are probably terrified, that a new government, might demand a renegotiation of their power purchase contracts. Likewise with the LNG terminal operators, who are also likely playing out various scenarios about how a new government might play out for them? The new government has to draw up an action plan for building reserves to take to the IMF, it has to arrange immediate revenues to prevent runaway fiscal deficit, manage outstanding payments to the power producers (either by twisting their arms or by borrowing to bring down their receivables and keep the turbines running). The work that is cut out for Khans’ government is not a crisis, but it is moving fast with a decisive direction to avert a possible future crisis. This job will become difficult to execute if the government is unable to snap out of campaign mode, or gets stuck in the politics of vengeance and decides to pursue its opponents from yesterday, or gets bogged down in explaining its choices and the politics of necessity if it has to make unsavory coalitions, or if it delays attention to economic management, thereby blowing the window of opportunity and allowing the situation to descend into a crisis. How fast the new government can move is now crucial, and the parliamentary arithmetic could complicate a quick and robust response. The confusion will be amplified if questions about the vote are raised and rigging allegations pile up before the courts and the media. Stories of what happened at the polls will be told in the days to come. Every bit of legitimacy that the incoming government can muster will count, given the choices it has to make in its early days. If all goes well, a crisis may yet be averted. Stories of what happened at the polls will be told in the days to come. Every bit of legitimacy that the incoming government can muster will count, given the choices it has to make in its early days. If all goes well, a crisis may yet be averted. Next Priyanka quits Bharat. Is her wedding to Nick Jonas the reason?